An old friend commissioned me to make a pendant incorporating an old tooth that one of her friends gave her. She had a pretty clear vision of what she wanted, and here's what I came up with. The design of the frame is almost identical to the Cellini Marquis, but I added a few extra rounds to make it bigger. Boy, you blow up a photo of beadwork, and the mistakes really jump out at you. Fortunately, the missing beads on the bail were fixable. Ahh. All done. 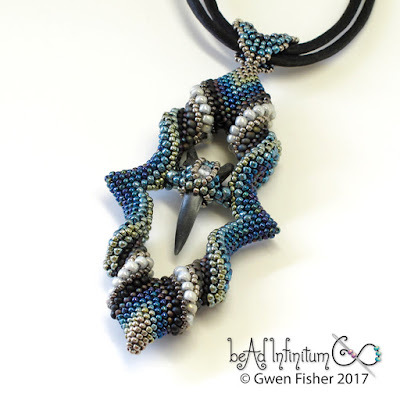 You can find the tutorial for the Cellini Marquis pendant in my Etsy shop. Thanks for looking.